Real Eyes 3 BOOKS : Will they ever trust us again? Real Eyes 7 The Election 2004 was Hacked! HEAR AUDIO: This time there will be no evidence. VOTERGATE RULES!!! Thursday, November 4th, 2004 Cpl. Roberto Abad, Sgt. Michael D. Acklin II, Spc. Genaro Acosta, Pfc. Steven Acosta, Capt. James F. Adamouski, Pvt. Algernon Adams, Sgt. Brandon E. Adams, Spc. Clarence Adams III, 1st Lt. Michael R. Adams, Pfc. Michael S. Adams, Lt. Thomas Mullen Adams, Spc. Jamaal R. Addison, Lance Cpl. Patrick R. Adle, Capt. Tristan N. Aitken, Spc. Segun Frederick Akintade, Lance Cpl. Nickalous N. Aldrich, Spc. Ronald D. Allen Jr., Sgt. Glenn R. Allison, Lance Cpl. Michael J. Allred, Capt. Eric L. Allton, Cpl. Nicanor Alvarez, Cpl. Daniel R. Amaya, Pfc. John D. Amos II, Lance Cpl. Brian E. Anderson, Airman 1st Class Carl L. Anderson Jr., Petty Officer 2nd Class Michael C. Anderson, Spc. Michael Andrade, Pfc, Spc. Yoe M. Aneiros, Lance Cpl. Levi T. Angell, Army Spc. Edward J. Anguiano, Chief Warrant Officer Andrew Todd Arnold, Lance Cpl. Alexander S. Arredondo, Spc. Richard Arriaga, Staff Sgt. Jimmy J. Arroyave, Spc. Robert R. Arsiaga, Sgt. Evan Asa Ashcraft, Pfc. Shawn M. Atkins, Maj. Jay Aubin, Capt. Matthew J. August, Lance Cpl. Aaron C. Austin, Spc. Tyanna S. Avery-Fedder, Lance Cpl. Andrew Julian Aviles, Pfc. Eric A. Ayon, Sgt. 1st Class Henry A. Bacon, Sgt. Andrew Joseph Baddick, Staff Sgt. Daniel A. Bader, Staff Sgt. Nathan J. Bailey, Spc. Ronald W. Baker, Spc. Ryan T. Baker, Sgt. Sherwood R. Baker. It's not even Election Day yet, and the Kerry-Edwards campaign is already down by almost a million votes. That's because, in important states like Ohio, Florida and New Mexico, voter names have been systematically removed from the rolls and absentee ballots have been overlooked�overwhelmingly in minority areas, like Rio Arriba County, New Mexico, where Hispanic voters have a 500 percent greater chance of their vote being "spoiled." Investigative journalist Greg Palast reports on the trashing of the election. Through a combination of sophisticated vote rustling�ethnic cleansing of voter rolls, absentee ballots gone AWOL, machines that "spoil" votes�John Kerry begins with a nationwide deficit that could easily exceed one million votes. Why the sudden urge to purge? Davidson's chief of voting law enforcement is Drew Durham, who previously worked for the attorney general of Texas. This is what the former spokesman for the Lone Star State's attorney general says of Mr. Durham: He is "unfit for public office... a man with a history of racism and ideological zealotry." Sounds just right for a purge that affects, in the majority, non-white voters. And to give a boost to this whitening of the voter rolls, for the first time since the days of Jim Crow, the Republicans are planning mass challenges of voters on Election Day. The GOP's announced plan to block 35,000 voters in Ohio ran up against the wrath of federal judges; so, in Florida, what appear to be similar plans had been kept under wraps until the discovery of documents called "caging" lists. The voters on the �caging� lists, disclosed last week by BBC Television London, are, almost exclusively, residents of African-American neighborhoods. It's 10pm: Do you know where your absentee ballot is? Voters wary about computer balloting are going postal: in some states, mail-in ballot requests are up 500 percent. The probability that all those votes�up to 15 million�will be counted is zip. Had she worked it the other way, disappearing a few thousand votes instead of adding additional ones, there would be almost no way to figure out the fix (or was it a mistake?). Mail-in voter registration forms are protected by federal law. Local government must acknowledge receiving your registration and must let you know if there's a problem (say, with signature or address) that invalidates your registration. But your mail-in vote is an unprotected crapshoot. How do you know if your ballot was received? Was it tossed behind a file cabinet�or tossed out because you did not include your middle initial? In many counties, you won't know. "If the vote is stolen here, it will be stolen in Rio Arriba County," a New Mexico politician told me. 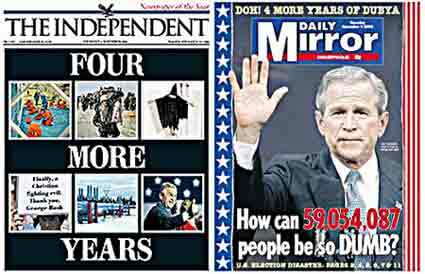 That's a reasoned surmise: in 2000, one in 10 votes simply weren't counted�chucked out, erased, discarded. In the voting biz, the technical term for these vanishing votes is "spoilage." Citizens cast ballots, but the machines don't notice. In one Rio Arriba precinct in the last go-'round, not one single vote was cast for president�or, at least, none showed up on the machines. It's bad for Hispanics; but for African Americans, it's a ballot-box holocaust. An embarrassing little fact of American democracy is that, typically, two million votes are spoiled in national elections, registering no vote or invalidated. Based on studies by the U.S. Civil Rights Commission and the Harvard Law School Civil Rights project, about 54 percent of those ballots are cast by African Americans. One million black votes vanished�phffft! The total number of votes siphoned out of America's voting booths is so large, you won't find the issue reported in our self-glorifying news media. The one million missing black, brown and red votes spoiled, plus the hundreds of thousands flushed from voter registries, is our nation's dark secret: an apartheid democracy in which wealthy white votes almost always count, but minorities are often purged or challenged or simply not recorded. In effect, Kerry is down by a million votes before one lever is pulled, card punched or touch-screen touched. And not all vote spoil equally. Most of those votes, say every official report, come from African American and minority precincts. We saw this in Florida in 2000. Exit polls showed Gore with a plurality of at least 50,000, but it didn't match the official count. That's because the official, Secretary of State Katherine Harris, excluded 179,855 spoiled votes. In Florida, as in Ohio, most of these votes lost were cast on punch cards where the hole wasn't punched through completely�leaving a 'hanging chad,'�or was punched extra times. Whose cards were discarded? Expert statisticians investigating spoilage for the government calculated that 54 percent of the ballots thrown in the dumpster were cast by black folks. So here we go again. Or, here we don't go again. Because unlike last time, Democrats aren't even asking Ohio to count these cards with the not-quite-punched holes (called "undervotes" in the voting biz). Exactly how many votes were lost to spoilage this time? Blackwell's office, notably, won't say, though the law requires it be reported. Hmm. But we know that last time, the total of Ohio votes discarded reached a democracy-damaging 1.96 percent. The machines produced their typical loss�that's 110,000 votes�overwhelmingly Democratic. First and foremost, Kerry was had by chads. But the Democrat wasn't punched out by punch cards alone. There were also the 'challenges.' That's a polite word for the Republican Party of Ohio's use of an old Ku Klux Klan technique: the attempt to block thousands of voters of color at the polls. In Ohio, Wisconsin and Florida, the GOP laid plans for poll workers to ambush citizens under arcane laws�almost never used�allowing party-designated poll watchers to finger individual voters and demand they be denied a ballot. The Ohio courts were horrified and federal law prohibits targeting of voters where race is a factor in the challenge. But our Supreme Court was prepared to let Republicans stand in the voting booth door. In the end, the challenges were not overwhelming, but they were there. Many apparently resulted in voters getting these funky "provisional" ballots�a kind of voting placebo�which may or may not be counted. Blackwell estimates there were 175,000; Democrats say 250,000. Pick your number. But as challenges were aimed at minorities, no one doubts these are, again, overwhelmingly Democratic. Count them up, add in the spoiled punch cards (easy to tally with the human eye in a recount), and the totals begin to match the exit polls; and, golly, you've got yourself a new president. Remember, Bush won by 136,483 votes in Ohio. Now, on to New Mexico, where a Kerry plurality�if all votes are counted�is more obvious still. Before the election, in TomPaine.com, I wrote, "John Kerry is down by several thousand votes in New Mexico, though not one ballot has yet been counted." New Mexico reported in the last race a spoilage rate of 2.68 percent, votes lost almost entirely in Hispanic, Native American and poor precincts�Democratic turf. From Tuesday's vote, assuming the same ballot-loss rate, we can expect to see 18,000 ballots in the spoilage bin. So we can call Ohio and New Mexico for John Kerry�if we count all the votes. Kerry won, so hold your victory party. But make sure the shades are down: it may be become illegal to demand a full vote count under PATRIOT Act III. I used to write a column for the Guardian papers in London. Several friends have asked me if I will again leave the country. In light of the failure�a second time�to count all the votes, that won't be necessary. My country has left me. Aid agency MSF pulls out of Iraq amid extreme risk for staff The aid agency Doctors Without Borders said it was pulling out of Iraq because of escalating violence in the country and the danger to its staff. MSF said in a statement Thursday that it had taken the decision "in the light of the extreme risks taken in the country by humanitarian workers". It blamed the pullout primarily on the risk of kidnappings and violence by some insurgents, as well as on coalition forces limiting its "humanitarian space". "It has become impossible for us, as an international humanitarian organisation, to guarantee an acceptable level of security for our staff, whether they are expatriates or Iraqis," said Gorik Ooms, director general of MSF-Belgium. "We deeply regret that we are no longer able to bring medical aid to the Iraqi people when they need it the most," he added in a statement released in Geneva. Jet fires at USA SCHOOL!!!! LITTLE EGG HARBOR, N.J. - A National Guard F-16 fighter jet on a nighttime training mission strafed an elementary school with 25 rounds of ammunition, authorities said Thursday. No one was injured. The military is investigating the incident that damaged Little Egg Harbor Intermediate School shortly after 11 p.m. Police were called when a custodian who was the only person in the school at the time heard what sounded like someone running across the roof. Police Chief Mark Siino said officers noticed punctures in the roof. Ceiling tiles had fallen into classrooms, and there were scratch marks in the asphalt outside. The pilot of the single-seat jet was supposed to fire at a target on the ground three and half miles away from school, said Col. Brian Webster, commander of the 177th Fighter Wing of the New Jersey Air National Guard. He does not know what happened that led to the school getting shot up. The plane was 7,000 feet in the air when the shots were fired. The gun, an M61-A1 Vulcan cannon, is located in the plane's left wing. It fires 2-inch-long bullets that are made of lead and do not explode, said Webster. "The National Guard takes this situation very seriously," said Lt. Col. Roberta Niedt, a spokeswoman for the state Department of Military and Veterans Affairs. "The safety of our people and the surrounding communities are our foremost concern." Schools in New Jersey were closed Thursday because of a teachers convention. Webster would not identify the pilot or detail possible disciplinary measures. Mike Dupuis, president of the township's Board of Education, said school workers are mindful that the firing range is nearby. "Being so close to the range, that's always in the back of our minds. It is very scary. I have children in that school and relatives that work there," he said. The range has been used by the military since the end of World War II, long before this area of south Jersey was developed.